IN 2013, MICHAEL Murphy returned home to Dingle from the UK following the sudden death of his father. His mother had passed away three years previously and he had no siblings. There was a farm to be tended to and paperwork to be taken care of. There was also the small matter of Kennedy’s, the family pub. Murphy’s grandparents had purchased it after returning home from the United States in the 1930s. For years, they operated it as a public house and grocers. Eventually, Michael’s parents took the reins and continued to operate it on an infrequent basis. His mother worked as a teacher while his father worked as a farmer. When Michael was born, his parents decided to put the pub on the backburner and focus on their day jobs. The pub became the family home and that’s how it remained for much of Michael’s adult life. Michael always believed he would take over the pub one day, but figured it wouldn’t come to pass until further down the line. With bills mounting and a licensed premises at his disposal, he decided to take the plunge and reopen Kennedy’s. Things that are hard to beat: The warmth of a fire and the rustic ambiance of a little pub in a small town. Walking through Dingle, it’s impossible to miss Kennedy’s. With a striking purple facade and blue lettering, it’s quite unlike anything else on the street. It’s a far cry from when he took over. “It was a bland terraced house on the street – grey in colour, didn’t really stick out,” he recalls. He decided he wanted to give the building a lick of paint, preferably in a colour that would catch people’s eyes. “Dingle is quite colourful so I drove around and made a note of what colours weren’t used,” he says. He settled on purple at the behest of his girlfriend. The signage was painted a shade of teal in a nod to his time in Brighton. “Teal is the city council colour for amenities in Brighton so you see that everywhere,” he explains. We put them together and they both complimented each other so it ticked all the boxes. He says the exterior belies what’s going on inside. “You think, maybe it’s this new funky modern pub and then you step in and it’s this pure traditional Irish pub,” he says. Cosy is a word that comes up a lot when talking about Kennedy’s. It’s something that Murphy has actively tried to nurture in the pub. Murphy also sought to create something that would stand out among the glut of pubs in Dingle. For instance, he saw a gap in the market for a pub with a solid craft beer offering. He started supporting microbreweries around Ireland and had upwards of twenty beers on offer. Likewise, the pub is stocked with spirits you don’t typically find in rural pubs. Think coffee tequila, mezcal and even absinthe. Similarly, Murphy has taken a different approach to music in the pub. Aside from that, Murphy says he’s open to people showing up and banging out a few tunes. Murphy says there’s no one type of customer who comes into Kennedy’s. Since reopening, he has met numerous people who used to drink in the pub when his grandparents ran it. Four and a half years ago, Murphy had never so much as pulled a pint. Now he’s au fait with being a publican, running a business, and being a boss. What is the biggest lesson he has learned? Email “'We'd never pulled a pint before opening night': How Kennedy's in Dingle became a pub... again”. 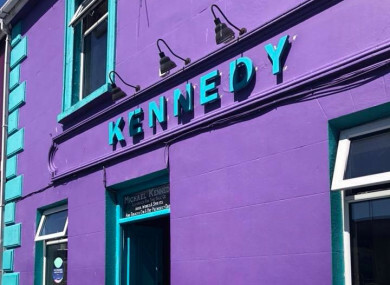 Feedback on “'We'd never pulled a pint before opening night': How Kennedy's in Dingle became a pub... again”.